Panoramic prints turn your pictorial memories into beautiful photo posters. Panoramic prints are unique decor; whether it be a panoramic photo featuring a seaside sunrise or sunset over majestic desert dunes. Panoramic prints can be printed from camera or phone images taken on magical summer holiday or simply from a weekend family walk. 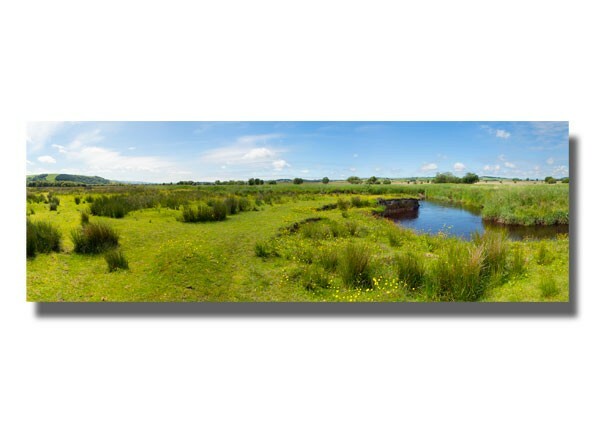 Your personal panoramic print will become a work of art to decorate your home. Simply upload your photo and choose the size range that best suits your photo. Despatched next working day. *Would you like to add text to your poster? Panoramic prints turn your photo memories into beautiful wall art. Panoramic prints are unique decor; whether it be a panoramic photo featuring a seaside sunrise or sunset over majestic desert dunes. Panoramic prints can be printed from camera or phone images taken on magical summer holiday or simply from a weekend family walk. Your personal panoramic print will become a work of art to decorate your home. Simply upload your photo and choose the size range that best suits your photo. Despatched next working day. Panoramas come in a wide range of sizes. Cameras and software today allow you to create beautiful, artistic panoramas. We are happy to print these into posters if possible, whatever the size! 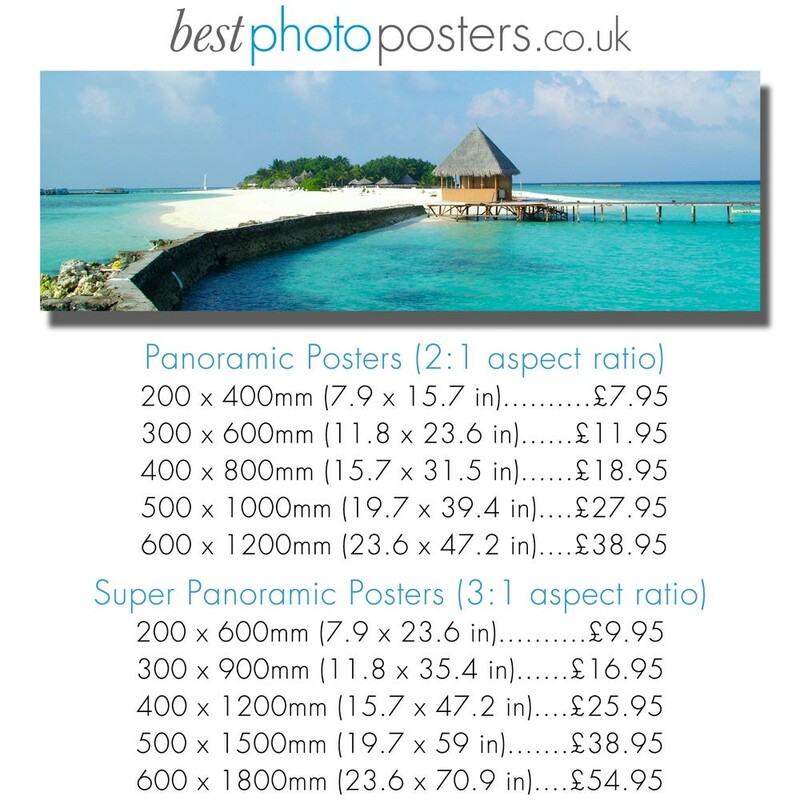 Our size range includes Panorama (1:2 aspect ratio), Super Panorama (1:3) and Ultra Panorama (1:4). 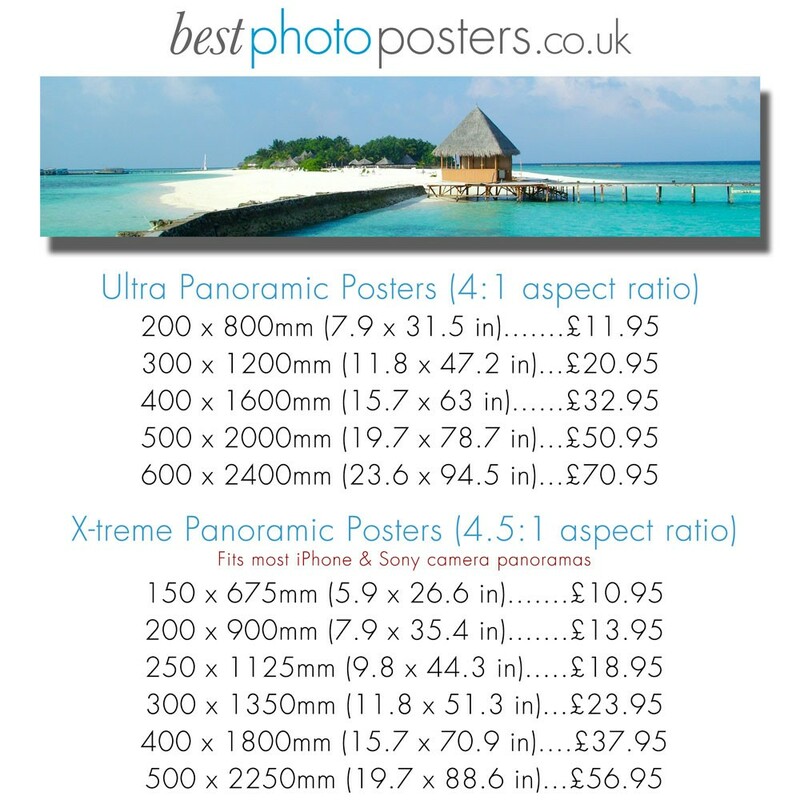 If you are unsure what size of panorama to order for your composition, or if your image is more extreme than the selection of sizes we offer on the website, please feel free to email us attaching the image. Simply let us know approximately what width or height you would prefer, we will email you with size and price options. Panoramic photo files can sometimes be quite large to upload. Though our website will normally handle files in excess of 200Mb without problem, occasionally you may experience difficulties due to internet speeds. Should this happen, please contact us for alternative upload methods. Questions? - Visit our poster printing information section. High resolution printing with vibrant colours onto high quality photo poster paper. Despatch next working day by 1st class post. Panoramic Prints - Very helpful and informative. Panoramic Prints - I have not seen my poster yet, but customer service was excellent. The first picture I sent was not of a good enough quality. They got back to me straight away. They have been nothing but helpful with my changing requirements. Huge thank you. Panoramic prints - Absolutely brilliant print quality maybe slightly high on the price scale but still great quality can’t fault them. Brilliant service. The customer service was great to ensure the quality of the print was perfect before they printed. I ordered 2 x panoramic's and they were both great quality. I needed a panoramic print for a client and chose the 23.6" x 7.9" size from this website. The print was delivered very quickly and the quality was fine. Just got the canvas and photo back. Absolutely amazing job that you have done. Thank you very much. Awesome !!! First time of ordering an ultra panoramic shot I’d taken with my compact camera. Very pleased with the result, quality and service. Pictures turned up ok. Fantastic, thanks for your good service. I'm sure I will be using your company in the Future, nothing was to much trouble for you to sort out, excellent 10 out 10 I say thanks. Happy customer from North Devon. Quick service and excellent quality. Thank you very much- my panorama picture looks beautiful! Very helpful, advising that the initial (ex-wattsapp) file was too small and then delivering an excellent quality print once the proper files were supplied. Very fast delivery and excellent advice and quality. Such good quality! I'm so pleased with the result. An excellent service. Good quality paper and good value. Fantastic service. Quality of print exceeded expectations. I will definitely be ordering more prints. Buy with confidence, 10 out of 10 from me. Bought panoramic pictures a couple of times via bestphoto. Online site is easy to use, quality of pictures is first class and delivery is always super quick and well packaged. Recommended online company. 10 out of 10. Excellent customer service and beautiful quality print. I was very impressed with the customer service. I raised a query about files size and image resolution which was answered on the same day I raised it, by e-mail. The turn around time was very fast and the panoramic print was delivered in a very tough tube in perfect condition. Best of all though was the quality of the print...a panoramic image a foot tall and 4 feet wide with vivid colours and sharp detail...it surpassed my expectations! I will definitley be using this service again and wouldn't hesitate to recommend it. I am a keen amateur photographer with over 30 years experience. I have never seen a better quality professional print. I have just collected my 2 prints: Wow! They are awesome. Both aspect ratios work really well when printed a meter wide, although I do prefer the 16 x 9 one. I will definitely be sending some more to you in the future: I will have to find space in my house to display them. Really impressed with the quality! Thanks for a very enjoyable reproduction of a file I have always wanted to be printed on panoramic one piece paper. Your use of top quality paper and inks, much appreciated. My own efforts on an A4 printer resulted in four separate A4 pictures which overlapped each other and made imperfect joints. The colour density - no where near as good. Thanks again, not forgetting the very prompt and accurate communications. Firstly, the product is excellant. Perfect print and on high quality paper, exactly what I was looking for. From sending my original enquiry via email to receiving my product 3 days later, I couldn't have asked for better service.